The summary and book chapter below represent our contributions to this text. The topic remains an area I have great enthusiasm about and high hopes for, when executed well. Irrational use of medications is a global challenge, with the World Health Organization (WHO) estimating that “more than half of all medicines are prescribed, dispensed, or sold inappropriately”. This situation is exacerbated by half of all patients not taking their medications as intended, with non-adherence rates in disorders like schizophrenia reaching over 70%. Medication non-adherence and polypharmacy (i.e., use of multiple medications) are massive barriers to optimal medication management and are the source of substantial health and financial costs. Mobile health (mHealth) offers myriad methods to address these challenges, ranging from simple text message reminder systems to ecological momentary interventions (EMIs) to leveraging interface versatility for eHealth literacy solutions. In this chapter, current scientific evidence will be used to explore the role of mHealth in enhancing pharmacy-related outcomes in varying healthcare settings and diverse populations. Current and future developments in mHealth will be explored through the lens of select disease states and patient populations. The next frontier in healthcare? The next step in patient-centered delivery of health services? Technology’s next overhyped bubble? There are grains of truth in all of these labels that have been given to mHealth. However, what is beyond debate is that there are opportunities with mHealth. In particular, I am optimistic about the opportunities with mHealth for pharmacists. To that end, I asked several colleagues to help outline the potential of this informatics arena. Those efforts were recently published as an article in the American Journal of Health-System Pharmacists (AJHP). My hopes are that this article serves to increase awareness of these opportunities and perhaps spurs some pharmacists to capitalize. Source: Clauson KA, Elrod S, Fox BI, Hajar Z, Dzenowagis JH. 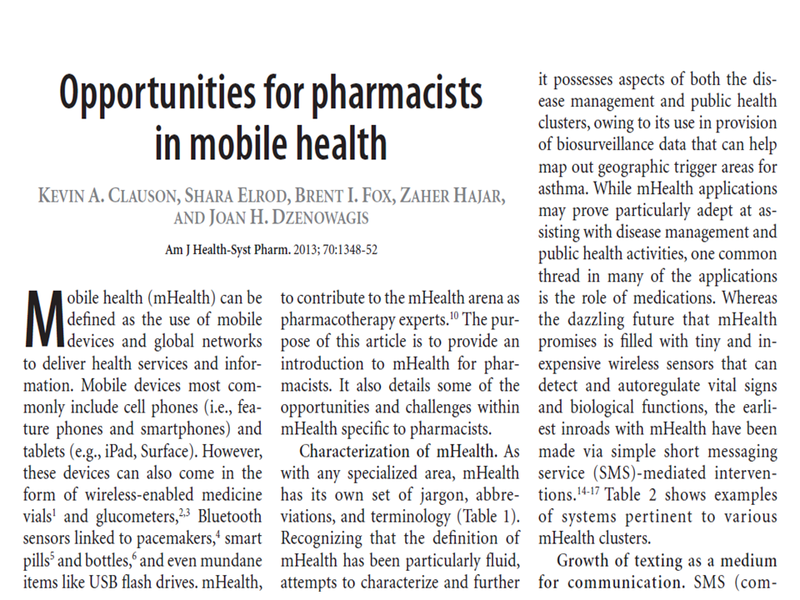 Opportunities for pharmacists in mobile health. Am J Health Syst Pharm. 2013;70(15):1348-1352. Kevin A. Clauson, Pharm.D., is Associate Professor; and Shara Elrod, Pharm.D., is Assistant Professor, College of Pharmacy, Nova Southeastern University, Fort Lauderdale, FL. Brent I. Fox, Pharm.D., Ph.D., is Associate Professor, Harrison School of Pharmacy, Auburn University, Auburn, AL. Zaher Hajar, Pharm.D., is Fellow in Consumer Health Informatics, College of Pharmacy, Nova Southeastern University. Joan H. Dzenowagis, Ph.D., is Senior Scientist e-Health World Health Organization, Geneva, Switzerland. What do pharmacy students think about #socialmedia for education? Dr. John Sandars has been looking at the roles of technology in medical education for many years. So when we decided to look at use of social media by pharmacy students (and their thoughts in particular on its use in education and engagement) I sought him out. As with any good collaboration, everybody brings a little bit to the table, and this one was no exception. 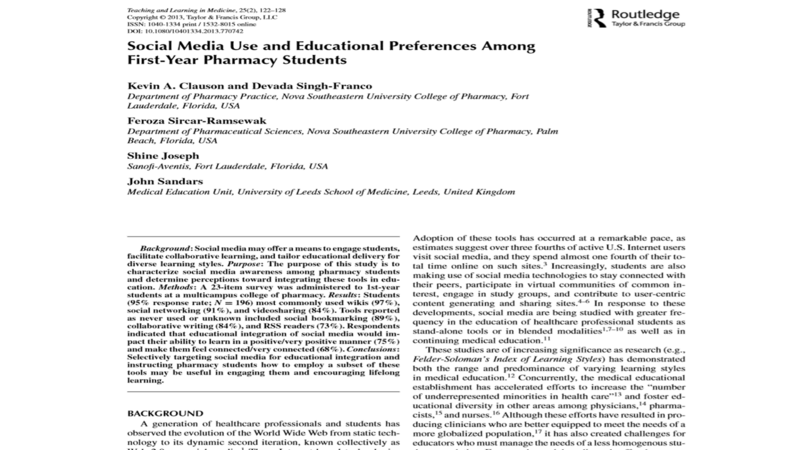 Our article “Social media use and educational preferences among first-year pharmacy students” was recently published in the journal Teaching and Learning in Medicine. One of my favorite developments within the Florida Society of Health-System Pharmacists (FSHP) has been membership’s growing interest in informatics. Of course, there are FSHP members who have been active in informatics for 20+ years, but the increased focus on it in the last 5 or so has been particularly encouraging. To that end, I was asked to present this year at FSHP Annual on one of my favorite topics – patients’ use of mobile health (mHealth) apps to enhance their self-management. The expanded slide deck from my FSHP presentation is below. A new journal, Future Learning, launched this year aims to provide “the current best thinking, research, and innovation for the effective utilization of technology for educators in higher education, professional education, workplace learning, continuing education, and life-long learning”. The inaugural special issue was on Social Media and Learning, and I am happy to have been able to help contribute an article to it. That issue (and hence our article, “Thematic analysis of pharmacy students’ perceptions of Web 2.0 tools and preferences for integration in educational delivery”) can be accessed for free via the journal’s download form here. Alternately, all abstracts from the issue can be read here. The journal arena is a crowded one, but I have high hopes for this effort by editor Dr. Lisa Gulatieri (@LisaGulatieri) and their Board. When you teach at a University with multiple campuses (in our case, Fort Lauderdale and Palm Beach in Florida and Ponce in Puerto Rico) even with live, interactive videoconferencing – you have to try and figure out ways to connect with your students at different sites. We’ve tried different methods over the years with varying success, but one that worked well early on was the use of an audience response system (aka clickers). This is something I talked about previously in the presentation, “The Science Behind Engaging Students in Class“. Our recent article in the American Journal of Pharmaceutical Education basically describes our multi-campus implementation and measurement of its impact on student engagement, satisfaction, and opinions about projected use of clickers in other courses. We also touched on related issues, such as clickers’ possible role in helping desensitize communication apprehension in students. Clauson KA, Alkhateeb FM, Singh-Franco D. Concurrent use of an audience response system at a multi-campus college of pharmacy. American Journal of Pharmaceutical Education. 76(1):6. Sometimes people ask why so many of our projects center around or involve interventions for diabetes…this (unfortunately) summarizes the answer quite nicely.